Crazy quilt by Mary Warner, April 3, 2017. 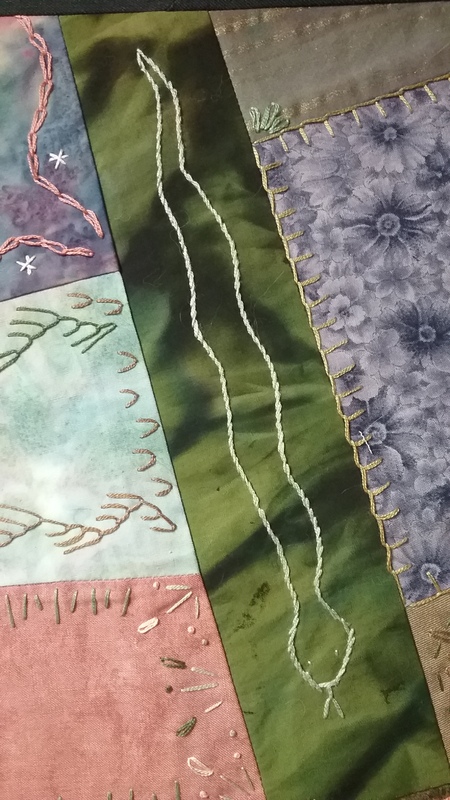 Last night, I tied my crazy quilt and hand-sewed the binding, completing a project I started probably a decade ago. I can’t tell you exactly when I started it because I don’t remember. It was quite the process, though, with lots of lag time between tasks. I was inspired to create a crazy quilt after hanging and examining some at work. (I work at the Weyerhaeuser Museum, which gives me the opportunity to handle fiber arts objects and inspect them up-close). 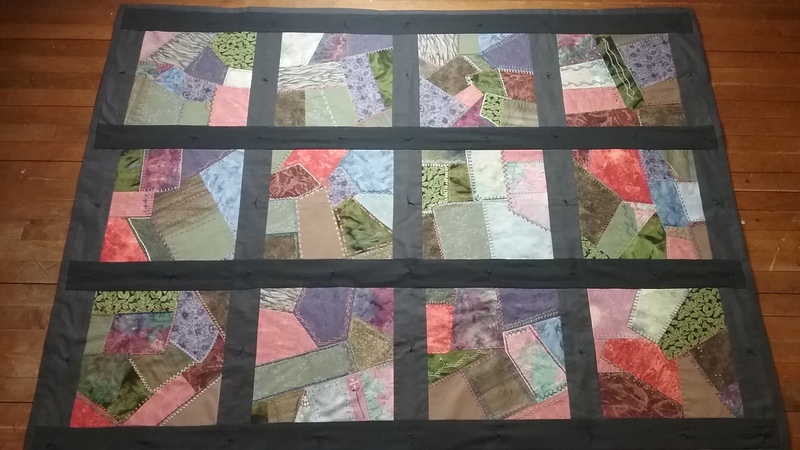 Noting that one of the crazy quilts in the collection was fashioned from a bunch of crazy quilt squares stitched together, I decided I wanted to try a similar method because handling squares would be much easier than trying to create one giant crazy quilt rectangle. 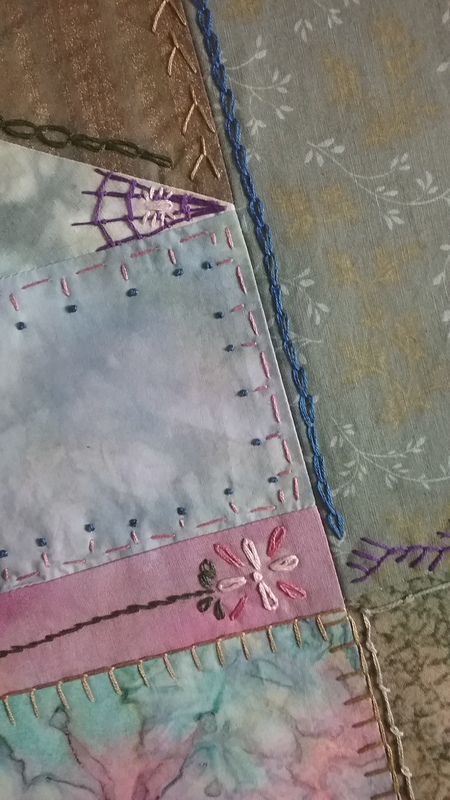 As you can see from the photo, I created 12 crazy quilt squares, which first involved applying the random pieces of fabric to squares of muslin. This was stage one of the process. Once I was done with this, I’m pretty sure I set the project aside for a while. When I picked it up to tackle it again, I worked on embroidering every edge, because that’s what you do in crazy quilting. While the varied fabrics and stitches seem as though they’d make a visual mess, there is a cohesiveness to the crazy. In the tradition of crazy quilting, I also included a few spider webs and flowers on the squares. I threw in a snake for good measure. I know the embroidery took a long time and that I set the project aside during this stage of the process because, honestly, how many blanket and chain stitches can one person do without becoming royally sick of them? 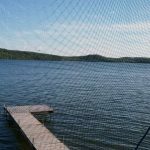 Spider web and flower on crazy quilt by Mary Warner, April 3, 2017. Snake on crazy quilt by Mary Warner, April 3, 2017. 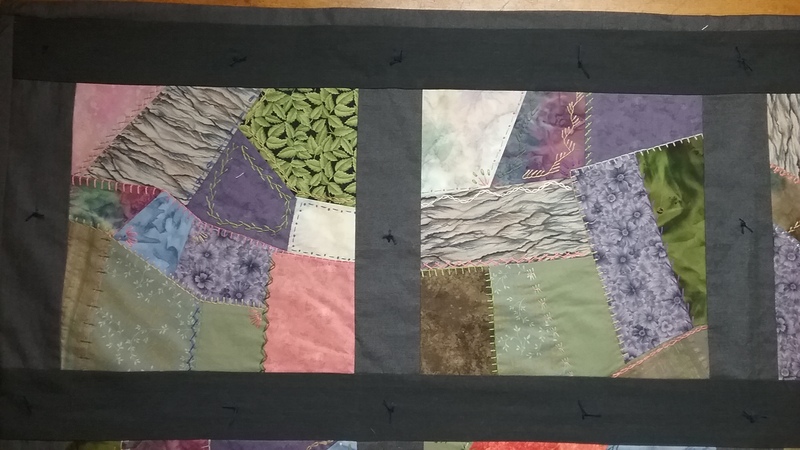 Once I finished the embroidery, I think I moved right on to setting the squares with the strips of gray fabric in order to make the quilt top. But, then again, maybe I took another break because that’s just the way this project was determined to play out. Obviously, I got the squares set at some point. Then I stopped and let the whole thing sit with my other unfinished projects until a couple of weeks ago. I was determined to get this project done. I had reclaimed muslin fabric for the back (we had made curtains from the fabric originally) and an old hospital blanket (love the weight of these!) for the quilt batting. I managed to get all 3 layers lined up and pinned. Three layers of crazy quilt pinned, ready for tying, by Mary Warner, April 2, 2017. Then, it was a matter of hand-tying the quilt, which, when a quilt is spread out on the floor like this, involves an awful lot of crawling around on the knees. The tying didn’t take too long, so I was able to move right onto sewing the binding, which I did while watching television. It’s not a good idea to sew while watching “Jonathan Strange and Mr. Norrell.” Too much concentration needed for both, so after an episode of the show, I stayed up a little later than normal in order to have the satisfaction of a long, slow quilt completed. Whew! 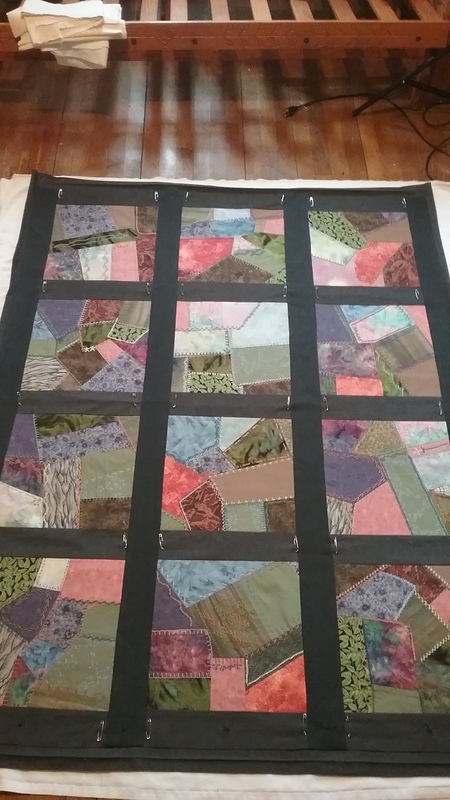 I’m very happy with the way this crazy quilt turned out. Two squares from crazy quilt by Mary Warner, April 3, 2017.